Historic Los Angeles City Council vote bans alcohol ads from city-owned & controlled property. 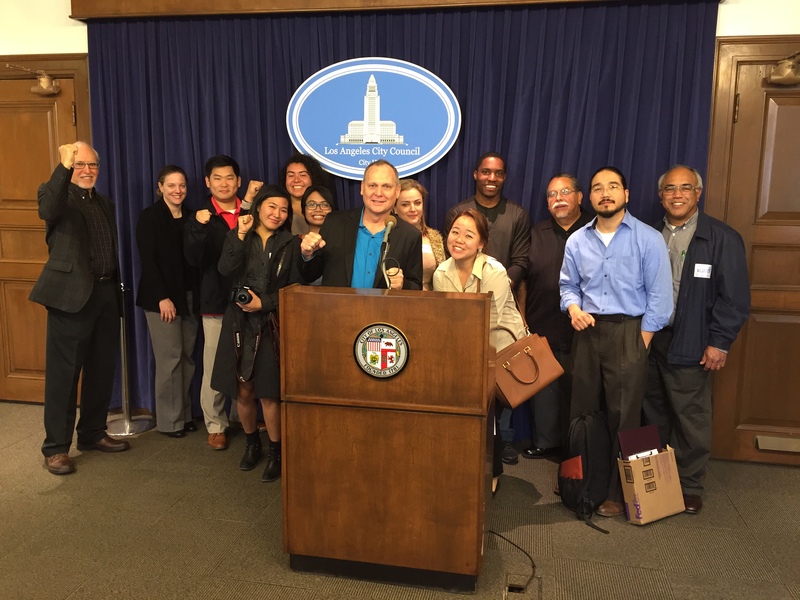 LOS ANGELES, Jan. 20, 2015 /PRNewswire-USNewswire/ — Alcohol Justice joined with Los Angeles-based coalition – NoAlcoholAds.org – to thank members of the Los Angeles City Council today for passing an ordinance long-sought by public health advocates to ban alcohol ads from L.A. city-owned and controlled property. The measure will reduce alcohol advertising in public spaces commonly seen by youth as a way to help discourage underage drinking. The ordinance, co-authored by Councilmembers Paul Koretz and José Huizar, was passed by unanimous vote of the councilmembers present. According to L.A. County Department of Public Health, alcohol-related crashes, violent crimes and deaths cost the county more than $10.8 billion every year. Families and youth utilize city owned and controlled property on a daily basis, such as school buildings, recreation centers, libraries and bus shelters. “This is in line with my administration’s focus on improving the quality of life all Angelinos and helping boosting the sense of pride people have in our neighborhoods,” said Los Angeles Mayor Eric Garcetti. The L.A. County Department of Public Health had recommended reducing alcohol advertising in public spaces and in areas commonly seen by minors as a way to help discourage underage drinking. Over the past few years UCLA, Rand Corp., Center on Alcohol Marketing and Youth, Dr. Jonathan Fielding, Alcohol Justice, and the L.A. Department of Public Health submitted clear and compelling evidence that alcohol advertising on city owned property encourages youth alcohol consumption, which leads to harm. In the summer of 2011, NoAlcoholAds.org, along with former Councilmember Alarcón, were able to influence a bus bench contract that effectively banned alcohol ads from 6,000 bus benches in L.A. Immediately after that victory they set a new goal to remove alcohol ads from all parts of the transit system.